According to the research organisation Mintel, in 2005 the number of couples marrying abroad was over 45,000; and the numbers seem to be growing each year. It’s now estimated that around 15% of all marriages are taking place overseas. When you consider the expense of getting married in the UK, the costs associated with an overseas wedding seem small by comparison. Add the bonus of predictable good weather and you wonder why many more couples don’t do the same? Figures vary but the average cost in the UK is often mentioned as being between £16,000 to £20,000 while the average overseas wedding tends to cost an average of around £6,000. A lot of couple are put off the idea by the complications of various formalities in different parts of the world. Around the European Union, and particularly in France, the rules are quite complex and rather prohibitive. But, with most, more exotic locations, the procedures are really quite straightforward and there is a lot of help available if you need it. Often many essential wedding items such as the bride’s bouquet, groom’s buttonhole, the marriage licence, cake and registrars fees are included as part of the wedding package. Don’t forget to change the name on your passport. You can arrange this up to three months before the ceremony, although you’ll be unable to use your passport until the actual day of your marriage or civil partnership. If you apply to amend your passport before you get married you will need leaflet PD1, which explains what you need to do, and form PD2 which is the passport application form. The twin islands of Antigua and Barbuda are renowned for their 365 beautiful beaches. Antigua is the perfect Caribbean holiday destination. Tiny sister island Barbuda, the quintessential unspoilt paradise of pristine pink-white sands and luxurious resorts, elevates relaxation to an art form. Weather: Avoid the hot, rainy season from May to September. The best time to visit is from December to March, excepting Valentine’s Day. Palm-lined Indian Ocean beaches and a fascinating culture, offering a more active honeymoon, plus the option of a twin-centre stay including the Maldives. Set in the Indian Ocean breathtaking views, magical experiences and friendly encounters define Sri Lanka. Highlights include the ancient capitals of Anuradhapura and Polonnaruwa, the cave temples at Dambulla, outstanding cousin and not to forget the magnificent elephants! Weather: The climate is tropical. Upland areas are cool and dry; coastal areas are warm but refreshed by sea breezes. The northeast monsoon blows from November to February, and the southwest monsoon from May to September. Temperatures are at their most pleasant from February to September. Documents: Couples must spend four days in the country before the wedding. Documents required include valid passports, birth certificates and proof of single status. Lovely beaches, an interesting culture and good hotels. 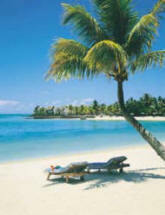 Set in a turquoise sea Mauritius is an oasis of peace and tranquillity. Weather: The best weather is in January to May, and October to November. The temperature on the coastal areas varies between 22°C in winter and 34°C in summer. Documents: In Mauritius the ‘Marital Status Act’ requires that you should be resident for 24 hours, and produce valid passports and original birth certificates. You will also need a certificate stating that you are not Mauritian citizens. Mexico enjoys some of the finest beaches, most luxurious resorts and best tourist facilities in Central America, along with a spectacular historical heritage. 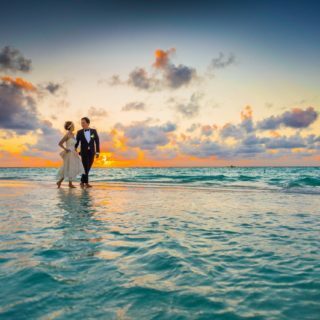 Couples can stick to the developed Cancun coast for an easy-to-organise wedding and then head inland for a more adventurous honeymoon. Highlights include: the temples and pyramids at Chicen Itza, the vast Xcaret eco-park, near Playa del Carmen, not to mention the buzzing nightlife and superb restaurants of Cancun and Playa del Carmen. Weather: October to May is the most pleasant time. The wettest months are June to September, but temperatures are reliably high year-round. Documents: Proof of ID and single status, plus a prenuptial medical certificate (a blood test is required). The entertainment Mecca of the World and famous for it’s quickie weddings, Las Vegas is the wedding capital of the US. It’s up to you what kind of marriage ceremony to go for – you can keep it simple at one of the many cute wedding chapels or you can go to the extreme and have your bash in the heart of Venice, or at the ultra luxurious Wynn Casino Resort. Themed options include Rat Pack Weddings – Elvis Weddings and Grand Canyon experiences. Weather: Las Vegas enjoys up to 12 hours of sunshine every day. Temperatures are most pleasant during March, April and May and winter months tend to be chilly. If you want to combine the beauty of a romantic beach wedding with the ease of a US based honeymoon then Hawaiian islands of Kauai, Oahu, Molokai, Lanai, Maui, and The Big Island make a perfect location. Weather: Hawaii generally enjoys pleasant and mostly warm sunny weather. Temperatures are fairly constant throughout the islands with August and September being the hottest months and February and March the coolest. Rainfall varies though high north east facing shores will suffer most wet weather.